Improved ring insulator with unique advantages ove traditional black ring insulators. Much stronger due to new technology. Category: Pacdog Electric Fence System. Improved ring insulator with unique advantages ove traditional black ring insulators. Much stronger due to new technology. More robust due to metal core. Chance of short circuit zero due to new design. 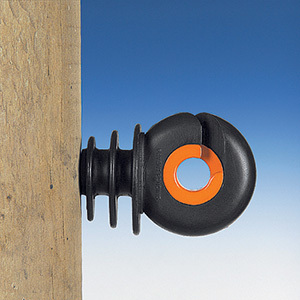 Suitable for (plasticised) wire in combination with wooden pole.